At Shaffer Amusement, our commitment to our customers goes beyond the initial installation. All of our equipment is backed by our 24/7/365 service guarantee. If you experience any problems or have any questions, you can contact us at our toll free number anytime - any day - of the year. Most problems you may encounter can be fixed the same day. Shaffer Amusement Company, LLC, "Shaffer Amusement," or the "Company" is a limited liability company organized in West Virginia on December 10, 2001. The company, whose corporate headquarters are located in Clarksburg, West Virginia, is a licensed video lottery terminal (VLT) operator in West Virginia. The company also places coin-operated amusement machines in retail locations throughout West Virginia. Shaffer Amusement Company was formed by Mr. Martin Shaffer and Mr. James R. McDonald, III in 2001 as lawmakers in West Virginia authorized the operation of video lottery terminals in the state. Previously, West Virginia had allowed the use of video poker machines, however the 2001 legislation banned the use of the so-called "gray" or "poker machines ", due to the state lottery commission's inability to track them and authorized 9,000 video lottery terminals in their place. A video lottery terminal is a stand-alone gaming machine that is connected to a central computer that allows the lottery commission to monitor game play and to collect its share of revenue. Prior to assisting with the formation of Shaffer Amusement, Mr. McDonald had prior work experience in gambling devices through his employment with McDonald Amusements, a gaming operator in South Carolina owned and operated by his parents, Jimmy and Cyndi McDonald. The West Virginia Lottery Commission controls all forms of gambling within the state. With regards to video lottery terminals, the commission conducts an auction in which potential operators submit sealed bids for the right to operate some of the 9,000 VLTs authorized for use in the state. The license period extends for 10 years. The original licenses issued in 2001 have expires and the new 10-year licensing period began on July 1, 2011. When Shaffer Amusement began its operations in 2001, it successfully bid on licenses to operate approximately 200 VLTs. Over a period of years, the company acquired additional licences. At the expiration of the initial 10-year licensing period in June 2011, the company had 430 VLTs in operation. In the auction conducted by the lottery commission, Shaffer Amusement was awarded licenses to operate 360 VLTs for the next 10 year term extending to 2021. The operator provides all the field support for the operation of the games including terminal repairs. The company contracts primarily with bars and fraternal organizations (American Legion, Moose, VFW, etc) to locate their video lottery terminals for the entertainment of the customers. The contract periods with the locations are usually 10 years, expiring with the term of the license. Since players must be at least 21 years old to wager, the VLTs are located only in adult-only environments, meaning premises that possess a Class A alcohol beverage control administration license. The licenses allow the operators to locate the VLTs in any approved location in the state. Although the company may locate its VLTs in any approved location, the geographic area serviced by Shaffer Amusement is primarily in the Clarksburg and north eastern portion of the state. The video lottery games are primarily keno and reel games. Players can wager between $0.05 and $2.00 per hand. The company shares the profits from the machines with the state of West Virginia and the owner of the location. Of the gross receipts, 2% is paid to the county in which the machine is located. Of the remaining 98%, the state of West Virginia receives 50% and the balance is divided between the location and the VLT operator. 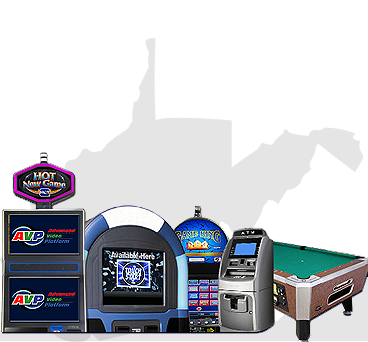 In addition to the operation of the gaming machines, Shaffer Amusement also places coin-operated amusement machines in retail locations throughout West Virginia. These machines include video game machines, pinball machines, pool tables and juke boxes. © 2013 Shaffer Amusement Co., LLC. All Rights Reserved.